Reporters, CART captioners, and students report a 98% successful pass rate when using the Textbook, updated 6th edition; Workbook: Developed as a testing resource –2,002 questions – to accompany the “Complete NCRA and State WKT Textbook”, and a Companion Study Guide as State CSR and NCRA RPR, RDR test prep primary review resources. 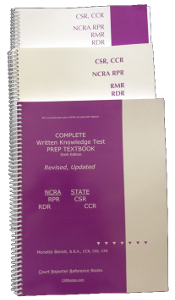 UPDATED, Expanded, Revised: Complete NCRA RPR, RDR, state CSR, CCR Test Prep Textbook, 6th Edition, is Ready! Are you? Material covers: Test-taking Tips; Legal terminology; Court procedures and deposition rules; English grammar and vocabulary; Idiomatic expressions; Preposition sentences; Confusing words; Antonyms; Synonyms; Misspelled words; Medical terminology and definitions; prefixes and suffixes; and Computer terminology, technology, ethics, NCRA Advisory Opinions, Review, and more. Experienced and novice reporters, CART Captioners, judicial, realtime writers, and students will improve skills and advance credentials. Information is presented in formats to maximize retention. Designed by court reporters and educators for court reporters and students. Learn the method to taking a test! Study, drill, quiz, review, understand and then … PASS YOUR TEST the first time! ** Learn how to take a test. ** Learn about the Written Knowledge Test and the ’d/a’ — distracting answer. ** Study the necessary ’areas of knowledge’ you will be tested on. ** Material you will review expands upon previous test questions to assist you to earn state and NCRA certifications. ** Learn how to answer the question by studying the foundation of information for state and NCRA RPR, RDR certification. The only textbook on the market to assist individuals to pass NCRA RPR, RDR Written Knowledge Tests and State court reporting CSR certifications. Before You Buy NCRA and State Court Reporting Test Prep Material Ask Ten Questions. 1. Will you have reference material to learn how to answer a question to improve skills and to advance credentials? 2. Will you learn why specific answers are correct, incorrect? 3. Will you access and learn test-taking tips? 4. Will you be able to pass your test the first time? 5. Will you learn how to answer questions by studying in formats specifically designed to maximize your retention? 6. Will you be able to clearly define what you need to know to prepare you to pass certifications? 7. Will you have material that assembles all the information in orderly fashion? 8. Will you study material produced by degreed educators and experienced court reporters for judicial and freelance reporters, CART Captioners, instructors, program directors, and students? 9. Will you have material you may keep and use as reference material for your court reporting library after you pass your certification? 10. Will you study material that has a successful 98% pass rate when used as primary resource material for working court reporters and students? Your CSR, RPR, RMR, RDR Court Reporter Reference Workbook is a windfall for the court reporting profession. The information in an easily-referenced and easily-retained format is a stroke of good luck for working reporters, students and instructors of court reporting. And what a delight to find an instructional textbook that is informative and entertaining! I have greatly appreciated the opportunity to fully review your fine book, CSR, RPR, RMR Written Knowledge Test Court Reporters Reference Textbook, which is aimed at assisting students to pass the written knowledge test given in conjunction with the NCRA RPR test and CSR state tests. This is to let you know how pleased I was to receive your book that will help students study to pass the WKT, written knowledge test. I use the “Court Reporter Reference” books in the preparatory classes that we offer every semester for our current students as well as working reporters in the area. You have covered all the areas that are on our test. You have saved me hours of work, and I appreciate all your effort. Thank you for providing such valuable tools toward preparing students for the RPR and CSR written knowledge tests. When asked if I would be willing to review the “RPR, CSR, RMR Written Knowledge Test Court Reporter Reference Workbook,” I probably should have said, “I’d love to, but I’m just a buried bureaucrat at VITAC, up to my ears in alligators. Why not ask Kathy DiLorenzo, Judy Brentano, Kevin Daniel or some other of those heroes laboring in the vineyard of realtime reporting to do it? They’re in the field every day, writing their little fingers off. How about those great educators, people like Judy Larson or Bill Oliver? Me, I’ve been reduced to a bean counter, nothing more.” Instead I melted, as usual whenever someone asks, “Marty, can you do …” and so here I am, an old soldier pressed into what is certainly not the most unpleasant duty. 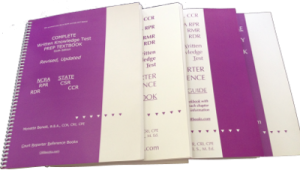 I give you my brief, but admiring review of the RPR, CSR, RMR Written Knowledge Test Court Reporter Reference Workbook. The “Workbook” is a remarkably versatile tool. In this age when the raw material of the average high school educated student gives teachers such poor clay from which to mold future reporters, here is a wonderful tutoring tool which can be utilized to make up for the years of educational neglect. Combined with the “Study Guide for Reporters and Students,” “The Court Reporter Reporter Reference Textbook,” the workbook simultaneously serves as a valuable vocabulary builder and imparter of critical knowledge to help the average contemporary student achieve excellence. 1. For further confirmation of the reviewer’s rights to this title, kindly refer to Page 188, Question 72, of the Court Reporter Reference Workbook. Your CSR, RPR Written Knowledge Test Court Reporter Reference book is the most exciting book I have come across in years. I have been teaching in the Court Reporting program at Del mar since 1971; and throughout these years, I have accumulated four file cabinets full of handouts that I use in preparing students for the CSR WKT test.